I’ve put in my time off requests for the holidays (and for our upcoming cruise in January)!! Once it was all signed off (by 4 diferent people) I almost danced around the office. I am taking Christmas week off for some ME time… lots of PJ wearing, garlic noodle making, You’ve Got Mail watching, with some scrapbooking in the mix. Damn, I really miss scrapbooking. I could have a sob fest about it right now, but I will soilder on and focus on how I get 2 whole days to myself (the others will be with Miss Autumn) to make a mess with pictures, washi tape, stamps, and such. Bliss. In the 9 days from when I leave work to return from the holidays I’m sure I’ll do some baking as well. Or plan on it and maybe I’ll just scrapbook instead. I dunno. I’m trying to stay quite focused on that so that I can zen out while I watch Tom Hanks and Meg Ryan exchange witty emails back and forth while I work on our 2014 project life. I am thinking about making these babies again though. They are perfect. 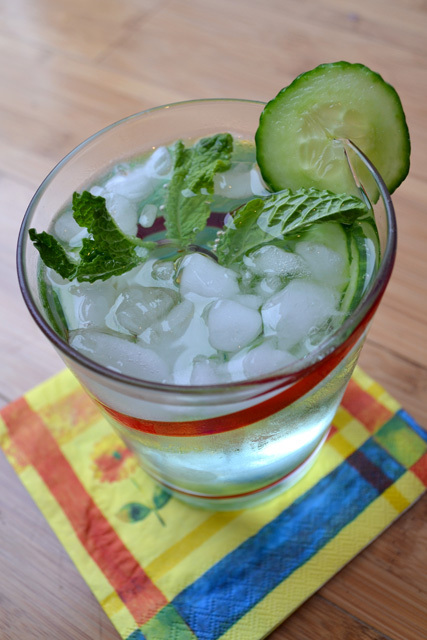 Minty. Chocoately. They scream winter to me. And there is plenty of minty frosting smack dab in btween 2 cookies. Aren’t cookie sandwiches the best? I have a funny story about making these cookies. UGH!!! And that is why you must notify other thieves in your house when making sandwich cookies. ha! I’m starting to think that all cookies should come in pairs with frosting in between. The world needs more cookie sandwiches. Def. I brought they babies into work to share so I cut them up. They cut in half pretty easily as the cookies are delightfully soft, and yet dense to hold up to the frosting filling. If you don’t feel like making sandwiches cookies then at least the cookies since they are so Christmasy good. What are you doing for the holidays? Any movie marahons? Crafting? Cooking and baking? Traveling? Stuffing your face with cookie sandwiches and spiked nog? To make the cookies, preheat the oven to 350 degrees and line cookie sheets with parchment paper/ use a silpat. 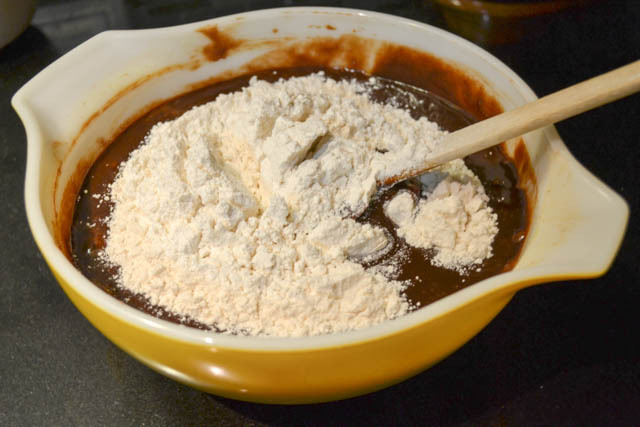 Wisk the flour, salt, baking soda, and cocoa powder in a bowl to combine. Set aside. Combine the butter and sugars in bowl and beat until light and fluffy. Add the eggs and vanilla extract to the sugar mixture and beat until combined. Add the dry ingredients to the bowl and mix until a dough as formed. 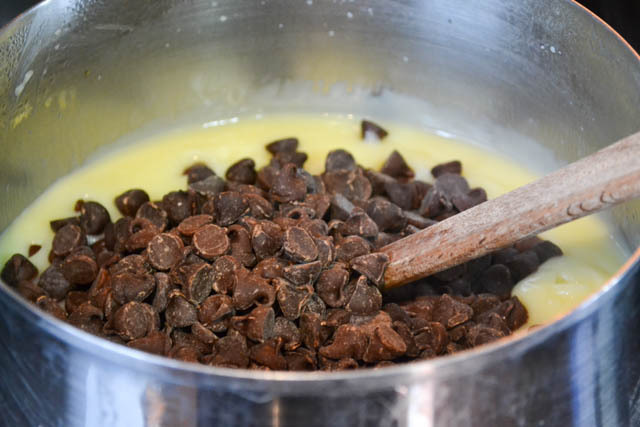 Once the dough has combined add in the minty chocolate chips and continue to mix. Divide the dough in half. From each half, scoop out even sized cookies until you have made 12 or 13 cookies (24 or 26 total). Bake for 12-14 minutes. Remove cookie sheets from oven when the center of the cookie is still soft to the touch. Let cool and set up for 5 minutes on the cookie sheet prior to removing. While the cookies are baking, make the sandwich cookie filling by beating the butter until light in color and fluffy in texture. Add the powdered sugar in small amounts and beat until combined. Add the food coloring, and extract. Add a bit of milk until you have reached your desired consistency, which should be thick but spreadable. Once the cookies have cooled completely, put a big dollop or pipe the frosting on the underside of a cookie. Add another cookie to sandwich it off. Yay!!! It’s Girl Scout cookie season! I get Girl Scout cookies every year. Typically I order them from one of my coworker’s daughter but being out on maternity leave I missed my chance to order from her. I was a little afraid that I would totally miss out on the opportunity to get those addictive Girl Scout cookies. But then I saw that a local troop would be setting up a table in my office building. Perfect! So I ran down one day and loaded up on this annual treat. Now Girl Scout cookies are great on their own but I’ve learned that you can enjoy them in a variety of ways, including in baked goods, like the Thin Mint Gooey Cake Bars I made last year. How can you go wrong with adding cookies to a dessert? You can’t! It just makes it better. Well, I had a box of Thin Mint cookies staring me down daring me to get to work. I had plenty of things in mind like cookies inside of cookies, cupcakes, and ice cream but ultimately decided to use the Thin Mints in a pie recipe. 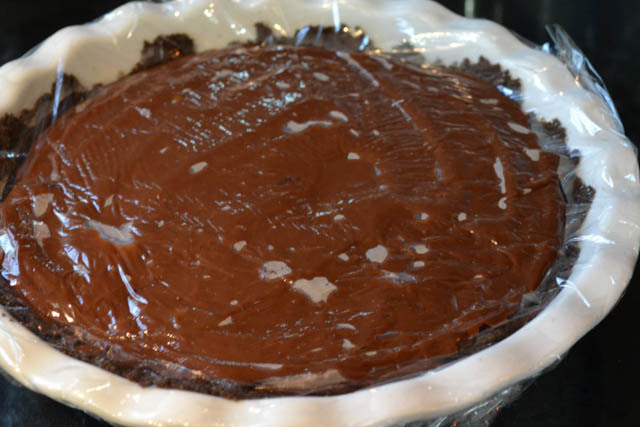 A minty, chocolaty pie… yes!! This pie uses the Thin Mints in the no bake crust and then the minty chocolate pudding filling is garnished with whole Thin Mints. A whole cookie with each slice!! This is such a simple pie to whip up. It takes about 20 minutes of active cook time and, thankfully, you don’t dirty many dishes either. Making the pudding filling is very easy but you can’t rush it or neglect it either. If you cook it on too high of a temperature or don’t mix it enough you run the risk of burning the mixture. If you burn it you have to start over again and use some serious elbow grease to scrub your pot. And you don’t want to go that. You want to eat pie. 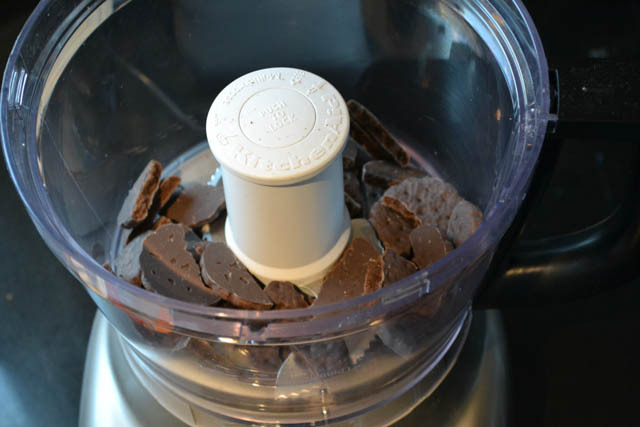 Add the Thin Mint cookies to the bowl of a food processor and process until crumbs form. Add the melted butter, mix well. 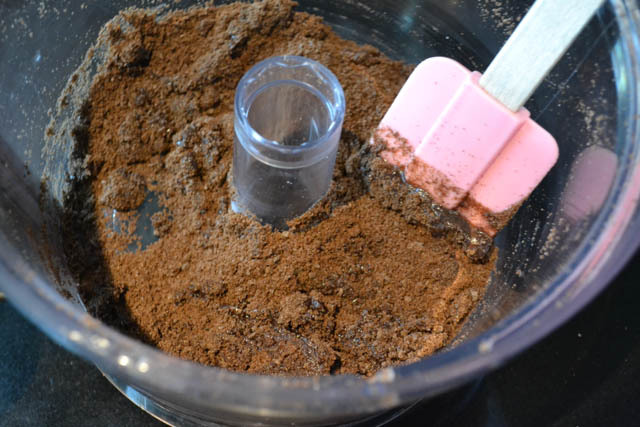 Firmly press the cookie crumb mixture into a 9″ pie plate. 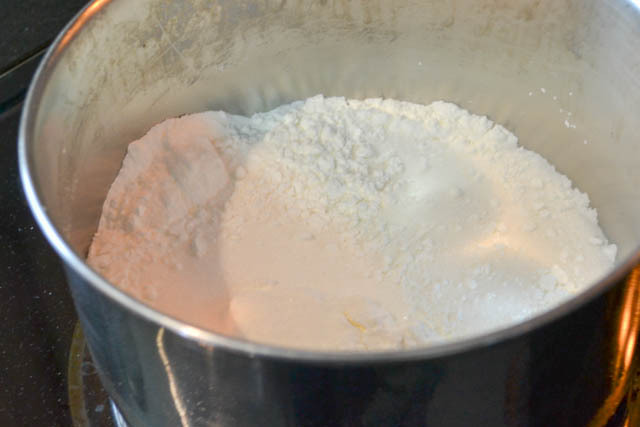 Sift together the sugar, cornstarch, and salt into a 2 quart saucepan. 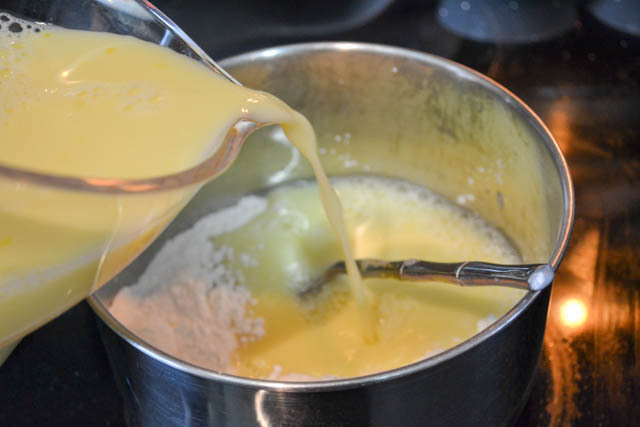 In a medium sized bowl, combine the egg yolks and milk. Slowly pour milk mixture into sugar mixture and stir to mix. Cook the mixture over medium-low heat, stirring constantly, until mixture comes to a low boil. Continue to stir continually while it cooks for 1 more minute. Remove from heat and stir in the butter and peppermint extract. 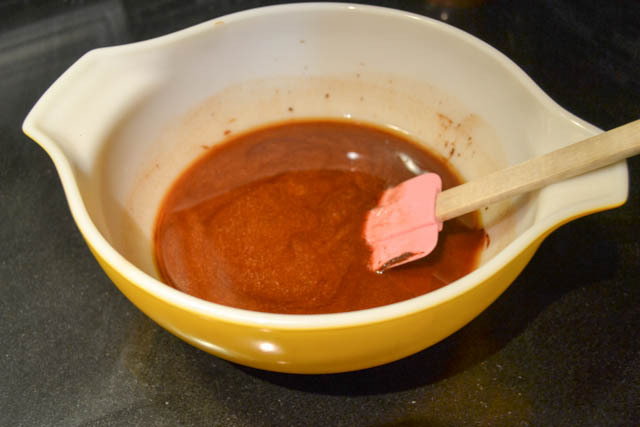 Add the chocolate chips and stir until chips are melted and the mixture is well blended. Let cool for 15-20 minutes, stirring it every 5 minutes. Pour into the Thin Mint cookie pie shell. Lightly lay a piece of plastic wrap on top of pie filling before refrigerating for several hours until chilled. Garnish with 8 Thin Mint cookies around the edge of the pie plate so that each slice would have a cookie. Looking for more Girl Scout Cookie Recipes? I’m kinda hooked on brownies. I have been baking them up like crazy lately and have plans on several more different kinds of batches to bake up in the next few weeks. I kinda can’t wait! Anyway, I whipped up these Andes Mint Chip Brownies up right after Christmas so that I could start to feel a bit more normal after having my typical life (showering, cooking, baking, eating, thinking) had been flip flopped after having Autumn. They are so quick and easy to whip up that even I can do them with new mommy brain! 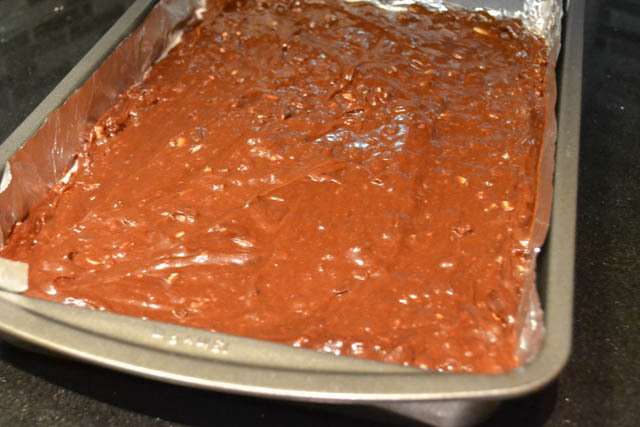 The base for these brownies might just be my favorite. It might be the butter. Or the chocolates. Or maybe it’s the butter AND the chocolates. Maybe it’s the combo of it all. Probably that all together they create a soft, yet sturdy, brownie. 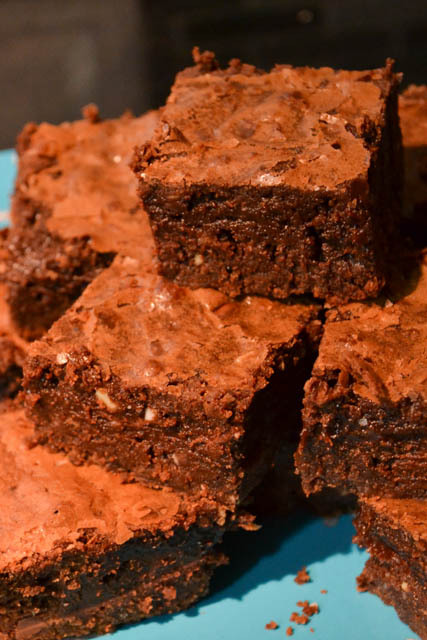 I’ve made plenty of really soft brownies that just about need a spoon to eat them (de-lightful!) 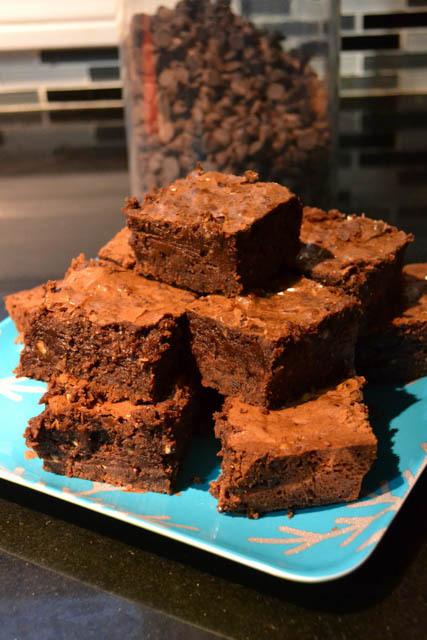 but these are bake sale brownies. What I mean by that is that you can cut them easier from the pan and could easily package them up to sell at the bake sale. Or toss into a lunch. Or delicately place on the rim of a glass of milk awaiting its sweet demise. 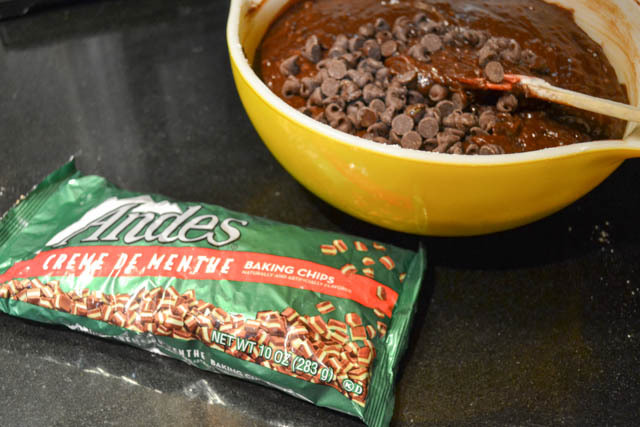 Adding the Andes Creme de Menthe Chips add such a great kick to the brownies. I just love this flavor. It just screams winter to me. 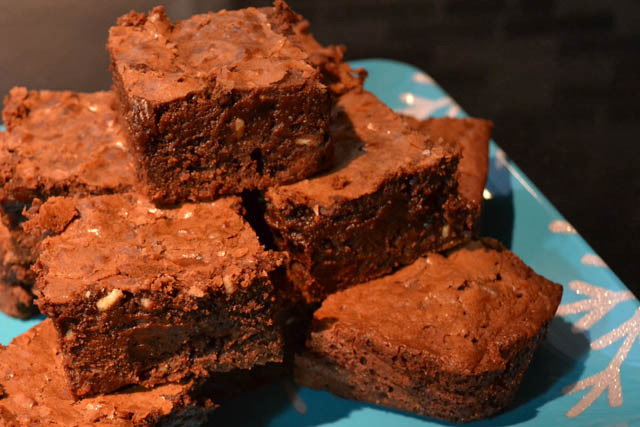 Since we’re still locked into this deep freeze from the “Polar Vortex” I think it would be a great idea to whip up a batch of these brownies to help you get through these cold days and nights. Days like this just call for a brownie and some hot chocolate. Preheat oven to 350 degrees. Prepare a 9×13 baking pan by buttering/spraying with non-stick cooking spray the bottom and sides and lining the bottom with parchment paper or tin foil. 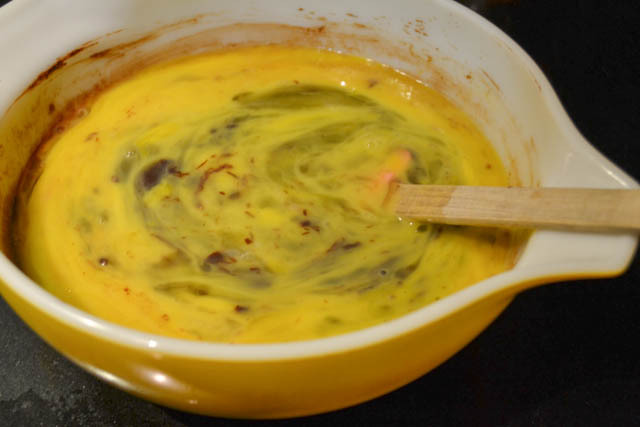 In a large microwavable safe bowl, melt 8 ounces of the chocolate chips and the butter together, stirring every 30 seconds until completely melted and combined. 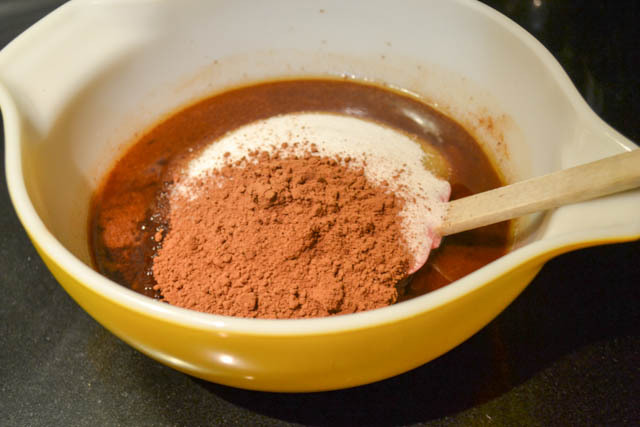 Add the cocoa powder and sugar, mixing completely. Add in the beaten eggs and vanilla extract. Stir in the flour, salt, remaining chocolate chips, and the Creme de Menthe chips to gently incorporate. Pour into the prepared pan and bake for 30-35 minutes, or until a toothpick inserted in the center is clean upon removal. Do not over bake. Let cool prior to cutting into 24 pieces.